Our volunteer cycle ride leaders are now all trained up and have started leading guided cycle rides round the local area! Our rides offer the chance to get outside, meet new people, get to know the local area better and improve your cycling skills. Cycling is cheaper and healthier than using the car or public transport, more flexible than public transport and quicker than walking. It can save you money and help you get fitter as well as helping to save the planet! 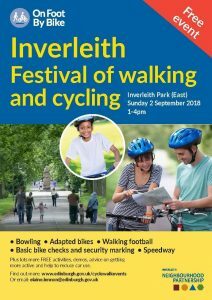 The first guided cycle ride yesterday took a group from Granton Parish Church to the Festival of Walking and Cycling at Inverleith Park, where Granton Goes Greener also had a stall. There was quite a lot of interest at the event in our cycle rides programme and this was where we first announced our next ride! The next ride, on the afternoon of Sunday 23 September, will leave Granton Parish Church at 1pm, cycling to Cramond. You can sign up on Facebook here. As First Reformed approaches its 250th Anniversary reconsecration (bankrolled by a local businessman whose company flaunts its eco-credentials despite being listed as one of the most polluting companies on the planet) Toller becomes more and more ill and more and more troubled. Can Toller find sanity and a constructive way to address environmental degradation within his role as a minister or will he finally go off the rails, taking others with him? This is a finely acted drama that asks important questions about the church’s relationship with the earth and it’s attitude to consumerism, power and money. Not to mention how the church looks after her own people. 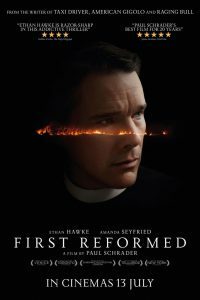 First Reformed is showing at the Edinburgh Filmhouse today and tomorrow. Catriona and Linda, two of our newly trained cycle ride leaders will lead a group of cyclists from the church to the festival at 12.30 after a free lunch at the church. Places will be limited so please let Catriona or Linda know if you want to take part! Everyone welcome so feel free to invite your friends. The festival will include free activities, demos, information, freebies etc for all ages plus the chance to have your bike checked and security marked for free. Obstacle course, walking football, crazy golf, Dr Bike, bowling, Petanque and more! It promises to be a fun filled afternoon as well as encouraging people to walk and take the bike more often. A Brighter Future for Granton Parish Church! As part of the capital funding from the Climate Challenge Fund, new lighting has been fitted throughout Granton Parish Church buildings. The new lights are not only brighter but more environmentally friendly and will save 6,133kWh of electricity a year, which is equivalent to 2.8 tonnes of CO2 per year. This makes a significant contribution to reducing the carbon footprint of the church building. The church building will also be fitted with new windows and insulation which will save 12,308kWh or 6.36 tonnes of CO2 per year. This building work complements the swap shop, bread redistribution and cycling project which all encourage people to reduce their personal carbon footprint. Muirhouse Community Shed will officially open on Monday 20th August at 10:00. The Shed, based at the old Co-op building on Pennywell Road is managed by North Edinburgh Arts and funded by the Climate Challenge Fund. The project aims to recycle, reuse and upcycle as much wood and furniture as possible, and to inform and upskill people in North Edinburgh to be more proactive about climate change. The Shed will also be open on the first Saturday of each month – 1st September 2:00pm – 4:00 pm; 6th October 10:30 – 12:30, and 3rd November 10:30 – 12:30. The shed is open to people living in North Edinburgh who are 16 +. The shed is free to use and refreshments will be provided. A creche can be offered if advance notice is given. People can currently work with wood and with fabric. Options may increase as the project develops. 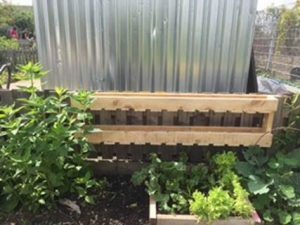 Participants can come along and work on their own projects or can offer their time to help Shed staff build items for the community, such as these vertical planters which the community garden at North Edinburgh Arts commissioned the Shed to build. If your organisation would like anything built get in touch with the Shed! Items would generally be free to local organisations. 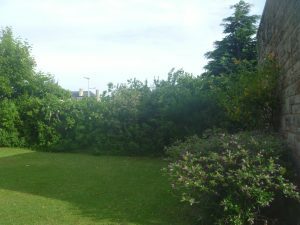 I’m a very keen naturalist and thought it would be interesting to have a look at the wildlife in the grounds of Granton Parish Church where Granton Goes Greener is based. This is just an introductory post, I hope to do more in the future. 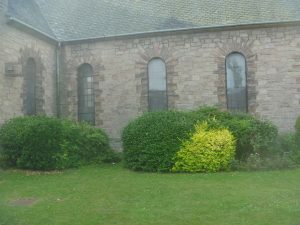 Granton Parish Church has a lovely churchyard with a number of shrubs and trees that are great for wildlife. Blackbirds have nested in the grounds and the flowering shrubs attract a variety of bees and white butterflies. Plus a pied hoverfly visited recently! 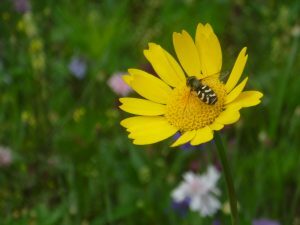 I tried to get its photo but it wouldn’t stay still so this is a photo of a pied hoverfly I saw in Spylaw Park recently. There are around 250 species of hoverflies in the UK, they’re fascinating insects that are harmless but mimic stinging insects such as wasps and bees. If anyone is interested in exploring the nature in the kirkyard please let me know! Similarly if you have seen interesting wildlife in the grounds please let me know! Faith Action for Nature is a great project, encouraging churches in Scotland to look after wildlife and manage their grounds for nature. They have resources on their website – you can see the Summer resource pack here! SHRUB Co-operative Have Big Plans! 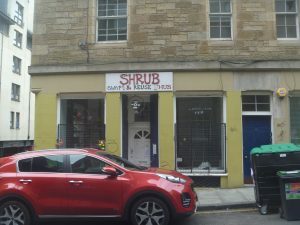 On Wednesday I visited SHRUB Co-operative a Swap and Re-use Hub in the centre of Edinburgh. They are currently preparing to expand into new premises. The building above, which is their current home which currently houses the Wee Spoke Hub is going to become entirely dedicated to this purpose.. The Wee Spoke Hub is where people can learn how to fix their bikes. SHRUB also run an inspiring range of workshops on up-cycling and sustainable living. A couple of years ago I went to one of their jewellery making workshops which was great fun! SHRUB also have a swap shop (which is currently closed while they organise their move). You can either turn up with something to swap on the day or your can become a member and donate items to build up swap credits which you can then use to take things at a later date. SHRUB are on a mission to make Edinburgh a Zero Waste city! SHRUB will be launching in their new locations over the summer and I’m definitely looking forward to seeing how they develop! As you may know, Granton Castle Walled Garden is a historic green space near the waterfront in North Edinburgh. The ‘Friends of’ group have campaigned hard to save the garden from housing developments, and in 2017 were granted access to the site. Since then, they have been working hard to restore the garden and organise a range of community events and activities with a number of local groups. The committee wants to make sure the garden remains a resource for the local community. This means securing a long term lease from the council and funding to restore and improve the space. The aim is for the garden to benefit all local people and at present volunteers organise open days, arts events, community growing, pick your own fruit days, workshops with local people, and host outdoor physical activity groups. But we want to do more – with wheelchair access and a toilet(!) the space can hopefully become a real asset for a range of local organisations. The Friends of Granton Castle Walled Garden are currently working with Community Enterprise to engage with local people and groups. We want to learn what local people would like to see happening in the garden, and how we can work in partnership with community groups in the area. We are planning a session with local groups on the 18th July and would be delighted if someone from your organisation would be able to come along. The plan is to start with a quick tour of the garden at 2.30pm for anyone who hasn’t seen it (weather permitting), and then host the meeting in Madelvic House (close by) from 3.15pm. The session will look at what needs and assets already exist locally and how the Garden can add value and work with other local groups. Refreshments will be provided. Please let us know whether you will be able to join us. These are the times when people will be available to help you at the swap shop, though the clothing rails are there all the time that the church is open and you are free to help yourself at those times. All clothing in the swap shop is free! Please remember that you need to weigh all items of clothing that you either donate to the swap shop or that you take away with you. This is so we can calculate how much carbon we are saving in the Swap Shop, which is something we need to report to our funders the Climate Challenge Fund and the European Structural and Investment Funds. To help us run this service, we are looking for volunteers for the Monday and Friday sessions (we already have enough volunteers for the Tuesday sessions). You can sign up for one session, take part in a rota or opt to do a stint of several weeks – whichever suits you! As a volunteer you would be expected to help sort out donated clothing, keep the rails stocked, weigh and record donated items and items that are taken away and chat to people using the store. You can find out more about volunteering with us here. Granton Goes Greener Has Now Officially Launched! On Saturday, we had beautiful weather for the official launch event for Granton Goes Greener. Most of the event took place in the grounds of Granton Parish Church. There was a poetry reading in the church itself featuring Rita Bradd, Elizabeth Rimmer. I stood in for another poet who wasn’t able to be there on the day. There were children’s stories, featuring stories from Jane Edwards, Julian Thomson and Jim Abercrombie with his grandson and his two rabbit hand puppets. The church congregation were brilliant at volunteering their time, including making delicious soup, baking an amazing array of cakes and making this brilliant bunting from upcycled fabric.